The roots of the Moniuszko Social Club can be found in the men’s choir of St. Hyacinth’s Church. After music director Professor Wlasyslaw (Walter) Sorys took a new position in Niagara County, the choir decided that is was time to strike out on its own and on February 20, 1914 the Moniuszko Singing Circle was born. 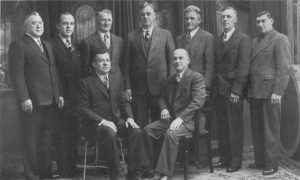 The founding members of Moniuszko Club included Frank L. Gestwicki, Stepjem A. Szymanowicz, Vincent J. Polowy, John J. Wojcinski, Valentine J. Gestwicki, Stanly F. Wojcinski, Joseph I. Andrzejewski, Frank J. Muszalski, and Alvin J. Domst. With Dunkirk’s well established Polonia, the group quickly found an audience. They soon began performing at every major function in Dunkirk’s Polish First and Fourth Wards, as well other venues around the city. In its early years the organization struggled financially due to the small size, never reaching more than 20 members. By 1917, the group was in such dire financial straits, the First Ward Falcons offered to incorporate the choir into their society. The two groups agreed to a six month trial but by early 1918 the Moniuszkos knew they were not going to join the Falcons. The desire to remain independent gave the club a new drive to expand. By August of 1920, they had enough members that a loan drive was launched to buy their own clubhouse. The group purchased an old building on Lake Shore Drive, not far from St. Hyacinth’s Church and on May 16, 1921 the Moniuszko Social Club was incorporated. The roaring ‘20s saw the membership in the society grow and in June of 1923, a new hall was added on to the building. As the building expanded, so too did the club’s offerings. There were pinochle and pool tournaments, basketball team and baseball teams, and the Boy Scout Troop 8 Drum Corps found a home at Moniuszko. With a supportive base and a good financial acumen the Moniuszkos weathered the Great Depression. They were in such a strong position that they even considered building a new clubhouse in 1934, before deciding against it the next year and remodeling the facilities instead. Over the course of World War II, 107 members of the society heard the call to free Poland. Of them, two made the ultimate sacrifice and never saw home and family again. In the postwar era membership once expanded and so too did the clubhouse, being remodeled and added on to again and again. The club also began focusing on more athletic endeavors and sponsored a Midget League Football team and an A League Softball team. Besides holding their own meetings and events, the Moniuszkos would also host other organizations like the Dunkirk Democrats when the political party brought in out of town politicians like the president of the Buffalo Common Council and a candidate for Supreme Court Justice, William B. Lawless who visited in 1959. In May of 2014, the club celebrated its centennial anniversary with a program and banquet held at the Blessed Mary Angela Social Center. Today the Moniuszko Social Club still stay in touch with it Polish roots by holding a birthday party to their namesake Stanislaw Moniuszko. History Committee. Souvenir Brochure of the Moniuszko Social Club, Inc. Silver Jubilee Banquet. Dunkirk, NY: Moniuszko Social Club, 1939. Print. Kaszubik, Keith A. "In Search of Polonia In Dunkirk." Am-Pol Eagle [Cheektowaga, NY] 3 Oct. 2002: 11. Print. Moniuszko Centennial 1914-2014. Dunkirk, NY: n.p., 2014. Print. "Moniuszko Club Breaks Ground for New Addition." The Observer [Dunkirk, NY] 15 June 2013: n. pag. Print. Notaro, Vicki. "‘Monnies’ Celebrate 100 Years." The Observer [Dunkirk, NY] 16 Nov. 2014: n. pag. Print. Witul, Greg. "The Moniuszko Social Club." Polish American Journal [Boston, New York] Nov. 2014: 8. Print.